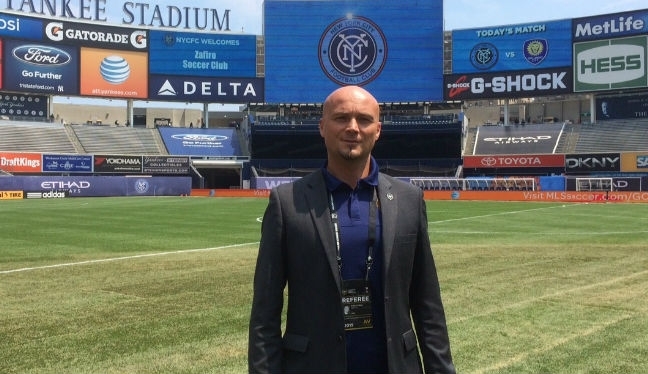 His officiating career in the Major League Soccer middle may only be two games old, but Robert Sibiga is already feeling the improvements under the guidance of PRO. Sibiga, who is listed as a fourth official on the roster, made his MLS refereeing debut at MAPFRE Stadium for Columbus Crew versus Los Angeles Galaxy in June, which came after he officiated at the Toulon Tournament in France. His second MLS game saw him officiate Real Salt Lake’s match-up with Houston Dynamo at Rio Tinto Stadium, which included a first red card, with the Dynamo’s Kofi Sarkodie being sent from the field. The key match incident was then discussed in a classroom session at a PRO training camp, which the referees attend every two weeks, and Sibiga praised the input from his colleagues. “It was the first time I’ve been at a camp where I had a game and there was a key match incident that needed talking about,” the 41-year-old reflected to proreferees.com. “I’m familiar with the mechanics and dynamics of camps – I love it and embrace it. It’s what will make me a better referee. “It’s a fantastic feeling to know that you can constructively discuss and reflect on the decisions that you make with 20 or so of your peers, who are often more experienced than you. “They offer their opinions on your decisions and you take their feedback on board and apply it into your game. There’s a huge amount of respect between all PRO officials. “The good thing about refereeing is that we all have different styles. People act differently in the same situations, so you can take all the feedback on board and implement the one that suits you, in the particular game you’re officiating in. “Refereeing is a difficult job, and it’s one that can be very lonely. A lot of training is done alone, so having camps every two weeks when you meet with people who experience the same things as you, helps to feel like one big family. Sibiga is a former soccer player who moved to the United States from Poland as a 21-year-old. He played amateur soccer in New York before suffering a serious knee injury, which is when he turned to refereeing. He has now been officiating for eight years and was most recently assigned to New England Revolution versus Houston Dynamo in MLS as a fourth official. Despite not being the man in the middle, it was another important top-level assignment for him and further exposure to a league that he believes will bring the best out of him. “MLS games are an amazing experience. I’ve been working and training hard building up to this moment. “After my injury I wanted to stay in the game so someone suggested refereeing. Since I had a considerable amount of experience in the sport, I was able to move up the ranks quite quickly. “It’s uncommon for someone to progress that quickly but I sacrificed four years of my life to go to every single youth tournament that was available to me. I would knock on doors and make as many phone calls as it took to gain more experience. Some people saw me and noticed my potential, and now I’m here. “In MLS there’s so much intensity; so much going on and the sequences happen so much faster than what I’ve ever experienced. It requires perfect focus and that’s something I’m learning. ← The Guardian: Are MLS referees up to the job?